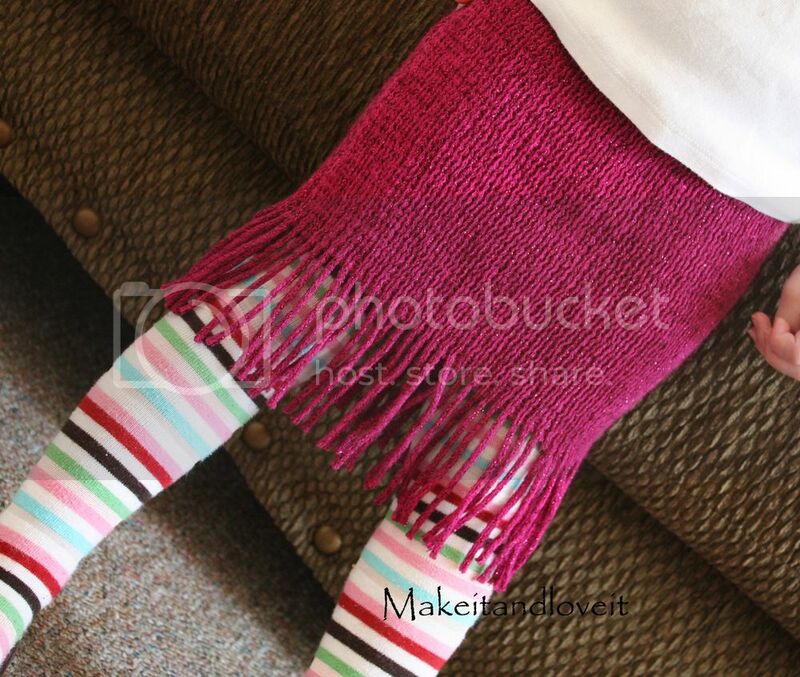 Okay, another crazy yet fun idea to re-purpose one of those scarves from that tangled up pile. Did you try out the last idea here? And the fringes just flap around with each step. **Suggestion: Try to cut into a scarf (or sweater) as little as possible. For any project. It’s hard to cut the scarf and then sew it back together because of the woven pattern in each scarf. It’s hard to get a strong seam…..with all of those loose ends of the woven scarf. So with each of these projects, I try to use the original sides or ends of each scarf as much as possible. It makes your project a lot easier. Just though I’d mention that. Start with a wide and stretchy scarf with a stringy fringe at each end. 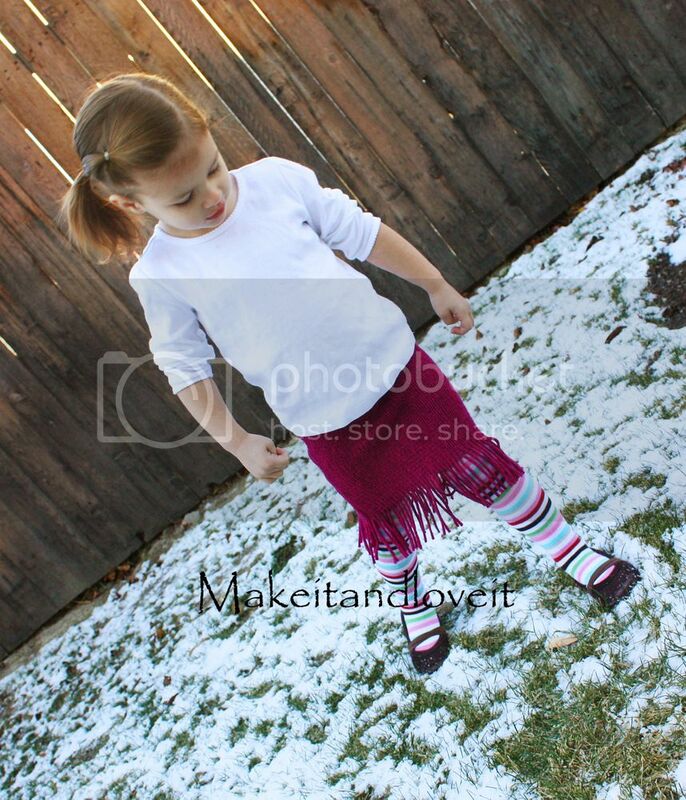 Make sure the width will fit around the front half of your little girl’s waist and legs. Then cut off enough from both ends (front and back piece) to have enough length for the skirt and a casing for the elastic at the top. And then add some more length to that because once she puts it on and stretches it out, it will shorten in length. Make sense? That’s it. Another quick and easy little scarf project. So cute! I wish I could convince my little tomboy to wear a skirt! YOu are joking! A skirt! How awesome!!! Love this! Your blog is the best! I always look forward to seeing what you post! That's stinkin' amazing!!!! LOVE it! Totally adorable, and totally inspiring! Very cute! love the fringe. Just finished making my first Little Guy Tie and it was sooooo easy and I love how it turned out. Thank you so much for selling this pattern. =) I can't wait to see him in it. So cute!!! I have been having a blast repurposing clothes this last week. Thanks to you!!! I so love this!!! Now if only all our scarves weren't hand crocheted, LOL! so cute. I have been so looking for a way to repurpose a scarf I have the perfect ugly red scarf of my hubby’s to use for my 1 yr old granbaby a skirt..